If you are looking for a newer 4 bedroom home on acreage with a private setting, this is it. Located on 42 acres, about one mile from the Robinson Mill Fire Station, This home has 2656 s.f. and many custom features. But maybe you need acreage and a home with guest or in-law quarters? This home can function as two separate units each with its own kitchen, open concept living area with gas fireplace, and separate HVAC system. A large laundry room connects the two sides of home and the double garage can be accessed by both as well. The home has many quality features: large deck with retractable, remote controlled awning, tank-less water heater, water softener, gas fireplaces, and a generator. Seller also installed a holding tank for the well, an extra measure of fire safety. Property has been cleared around the house with a pond just off the deck and a paved parking area to supplement the double garage. In the main living area, there is a Great Room where the huge kitchen has a center island and breakfast bar that seats 7, all open to the living and dining area. The other living area has a smaller but complete kitchen with breakfast bar open to the great room with its own gas fireplace. House is secluded on a gated private driveway, and cannot be seen from the road. 37.16 acres are in Butte County. 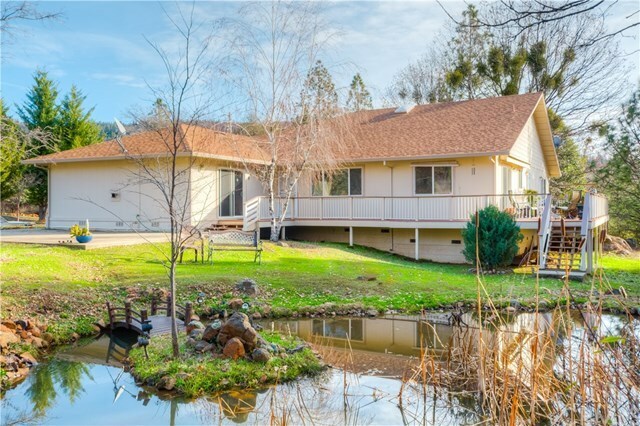 5 acres on the eastern end of the property in in Yuba County and does not have separate access. Natchez Creek runs through the middle of the property. Propane tank is owned. Directions: Olive Hwy (162), right on Forbestown Rd, right on Robinson Mill Rd, on the left. No sign. Inclusions: Park benches, propane tank, holding tank for well, water softener and iron fire pit in front yard are included.